Success is more than just winning at something. If that “something” is not tied into your values, or the person you want to be, there will be an emptiness inside. There needs to be a positive emotion attached to your accomplishment for you to feel true success. This emotion can include long term excitement about what you do, or feeling fulfilled that you would able to persevere through hard times, or living a life that you and your family can be pleased with. 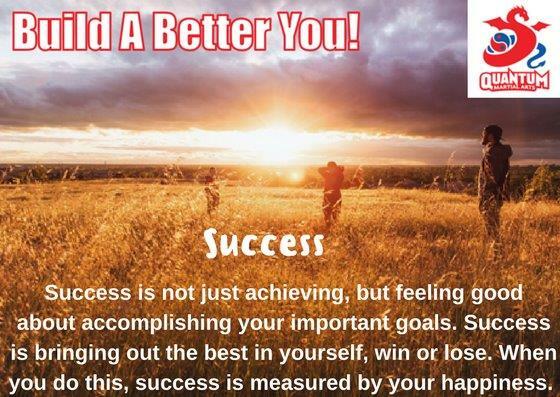 Therefore, success is about bringing out the best in yourself – physically, mentally and emotionally. A great example can be focusing on your martial arts grading and then achieving it. How good does that feel? Success is not easy. It requires desire, hard work, aiming for excellence, focused practice, drive, together with service to others. If you can give 100% to these aspects, win or lose, you will be a success.